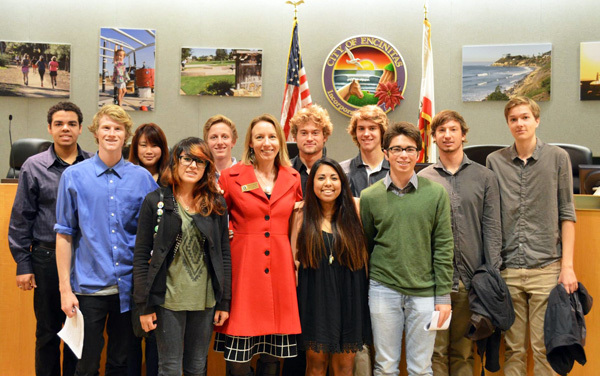 Last week was tough at the Encinitas City Council. At times the Council members disagreed with each other, with city staff and the recommendations staff supported. Additionally, the meeting lasted over seven hours with limited breaks, so toward the end my inner calm and patience were truly tested! The city staff presented a report that essentially said, “Because of the rising economy, we have about $1.3 million more at mid-year (mostly the result of more money from property taxes) than we expected. We propose distributing it among various departments for staff increases, and paying for other things, such as higher than expected utility costs.” As a responsible steward of the public’s money, I see that unexpected money like sand in our hands. If we don’t zealously protect it and prioritize where we put it, it will fall through our fingers and be gone. I fundamentally don’t support increasing the rolls of city staff during an expanding economy simply because staff wants it. So I rejected the planning department’s request for an additional $42,500 to move one position from part-time to full-time, and I also turned down a request to reclassify a vacant assistant city manager position to a higher salary category, which would have committed the city to an additional $42,200 yearly once the position is filled. I did support, along with the other Council members, Council Member Lisa Shaffer’s earlier proposal to direct a percentage of the unexpected increase toward the city’s unfunded pension liability. We put $254,700 toward this. We put off until a later meeting a decision regarding spending $300,000 for the environmental study required for the Housing Element. I feel compelled to hold the line on expanding the government payroll. In my own home and at my law office, I’d love to have more paid help. But the bottom line is that if I spend my money on personnel, I don’t have it for my utility bills or to take a family vacation. The more we spend on city personnel, the less we have for streets and improving parks (remember the half-fence project at Orpheus Park from last week?). Although there was not complete agreement on the different budget issues, in the end the vote was 5-0 to approve some and deny other expenditures. The next item, for me, is similar. The fire chief wants to hire three new full-time firefighters, personnel who will work at the Olivenhain fire station. For the last several years, these Olivenhain positions have been staffed by current firefighters working overtime. Apparently, it is cheaper for the city to pay overtime instead of hiring new people because of the additional costs associated with benefits and pensions. The Olivenhain fire station is permanent and here to stay. We just have to figure out how best to fund the positions. Simply put, the staff report and the presentation at the Council meeting didn’t convince me that it made sense to hire new people. The pitch is that the fire department wanted approval to apply for a grant to cover the majority of the three new firefighters’ salaries for two years. To me, this is like an introductory rate on a new credit card. It’s cheap for a two year honeymoon, but afterward the additional firefighters cost the city over half a million dollars every year. The first question is whether we need these to be full-time positions in our city. If we do, then we should look for a grant to cover as much as possible. Before I could agree to us applying for the grant, I had hoped to see a comparison chart showing how much it costs to staff these positions using overtime compared to the cost of hiring new people full-time. I would like to know exactly how much overtime we actually paid last year, not just theoretically how much these positions cost. This information was not available before the vote. I lost 4-1 on this. I can’t speak for the other Council members, but I think they believe it is not sustainable to staff the Olivenhain fire station using overtime and that it’s better to get a grant to cover these positions for two years, if we can. I may well come around to this view with more clearly documented information in the future. The use of our city’s money matters to me, and I know it matters to citizens and to each of the Council members. It’s up to each Council Member to do the necessary due diligence to feel comfortable in making these tough calls. I’m not knocking others who have been on the Council longer and understand the system better than I do. I recognize that some of them may have had in-depth conversations with the fire chief in private to really understand the numbers behind the proposal or may have had personal experience with budgeting for a fire station–Mark Muir is a retired fire chief afterall. But I believe that this information needs to be publicly presented in the staff report and available for the public, and I need to personally feel comfortable in order to buy in. And that didn’t happen for me this week. After spending four years on the Traffic & Public Safety Commission, it’s clear that the city needs to do more to create “complete streets”– streets that provide for pedestrians, bicyclists and cars. Tackling this is one of the main reasons I ran for City Council. Right now, there are many places in Encinitas where walking and biking around our city does not feel safe or pleasant, and consequently many people choose not to bike or walk. The motivated folks who live around La Costa Avenue gathered 40 signatures for a petition, spoke at hearings, organized with their local advocacy group, BikeWalk Encinitas, and sent multiple emails to the Traffic Commission and the City Council. What they want is a dedicated lane (or preferably a sidewalk), along the south side of La Costa Avenue near Coast Highway 101 for people to walk to the beach. They also want slower speeds, which can be accomplished by narrowing lanes. The La Costa Ave. bridge is the only way to legally cross the railroad tracks in that part of town. There are a large number of parents with strollers, families with wagons and other pedestrians headed to our sandy beaches along La Costa Avenue. 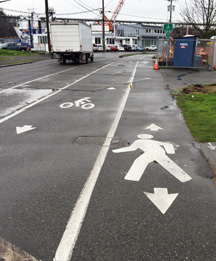 (This picture shows an example of what could work on La Costa Ave. just using paint). At the City Council meeting, the city’s engineering staff endorsed a conventional plan that included nothing specifically for pedestrians. 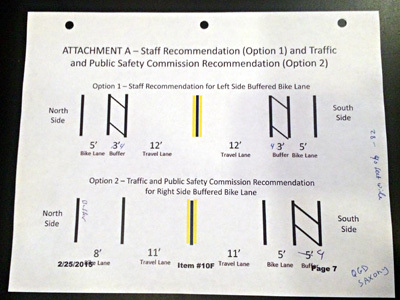 Their plan was to stripe a larger bike lane, and put what’s called a “buffer” or a section of road with cross-hatches, between the bikes and the cars. The community that followed this issue cried foul. Where are the accommodations for pedestrians? The city staff’s response was that people can continue to walk in the bike lane. Therefore the City Council was put in the position of choosing between two maps (see photo at right)– one recommended by city staff that did nothing for pedestrians, and a second one approved unanimously by the Traffic Commission and the community that created a place for pedestrians to walk. Both plans involve only paint, so if the solution doesn’t work it can be changed at fairly low cost. Council Member Shaffer asked the engineering department if there was any road configuration that the engineering staff could support that would create a separate place for pedestrians to walk. Unfortunately, the answer was essentially “no.” Here is the link to view this topic in the Council meeting. So on a 3-2 vote, Council Members Lisa Shaffer, Tony Kranz and I approved a hybrid of the two plans. It provides a dedicated lane for pedestrians and a lane for bicyclists, and narrows the travel lanes to 11 feet to slow speeds. This part of the meeting was unpleasant. It’s not ideal to design from the dais, nor do I want to. I want our professional subject matter experts to come forward with a plan that provides for progressive improvements on our streets. We can do better, and I continue to expect that we can and we will do better. Next week I have scheduled a meeting with the head of the engineering department and two of his engineers to discuss working collaboratively with each other in an environment of mutual respect. By way of contrast, the City Council recently approved a crosswalk and traffic calming on Saxony and Quail Gardens Drive, and the engineering staff came forward with plans that safely met the needs of the community. It was unfortunate that this didn’t happen on the La Costa Avenue project. At the end of the meeting, we dealt with Peak Democracy. If you’d like to read a news article about this issue, the Encinitas Advocate article is here. Politics and policy-making is a bumpy road. I accept and expect that. Since the meeting, I’ve had social conversations with the Mayor and city staff, and feel that we will be able to continue our progress toward more openness and the fostering of goodwill into the future. To paraphrase Teddy Roosevelt, I feel very grateful to be spending myself in this worthy cause. This week a group of Grauer School students visited City Hall. We staged a mock City Council meeting, complete with advocacy from some students and a unanimous vote by the student Council members. The students were engaged, articulate and thoughtful. America’s future is bright! Previous Post2/22/15: Dog Parks, Playgrounds and the Housing ElementNext Post3/20/15: Getting Better at This!